Dissolved carbon dioxide in wines is one of the key parameters of the wine sensory quality and is an integral part of the standard analyses performed by enological laboratories. Are you constantly looking for the best solutions to meet your customer’s needs, offering services that combine efficiency, reliability and precision? The dissolved carbon dioxide analyzer for still wines, the NomaSense CO2 P2000, enables high accuracy measurements and meets enological laboratories performance requirements. Thanks to its high accuracy, the NomaSense CO2 P2000 proves to be efficient in the laboratory for conventional analysis purposes or for verifying the calibration of multiparametric enological equipment. Real enological consulting tool, this precision analyzer can also be used directly in the cellar, allowing wine consultant carrying out real-time controls and thus improve his service by accelerating decision-making and delivering an adapted advice in real time. The results are obtained in less than 30 seconds by sampling only 50 mL of wine. Its simplicity of use and its pre-calibration make it a convenient and efficient analyzer in all circumstances. The calibration of our analyzer was carried out on different matrixes of wines taking into account the influence of the alcohol. The non-dispersive infrared (NDIR) measurement technology in gas-phase, specifically measuring the CO2 molecules, allows obtaining good reproducibility of the results (0.05 g/L if CO2 < 1 g/L; 0.1 g/L if CO2 > 1 g/L). 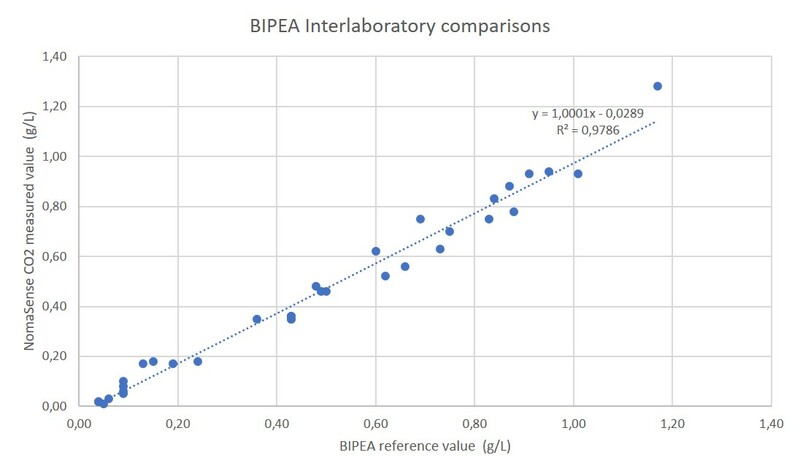 Since 2016, ring-test programs with BIPEA are conducted and confirm the reliability and precision of the measurements performed with the NomaSense CO2 P2000. Throughout the entire ring tests performed on CO2 parameter, the results are excellent. The difference between the values measured by our analyzer and the reference values is low and systematically under 0.1 g/L.